Over the years video wall systems have evolved, allowing end-users to make to make tremendous growth in their business goals. Video wall systems or displays are essential for immediate and effective audience engagement, not only these are eye-catching but they serve a great way to deliver crucial information/messages and makes brand presence impressive. Before diving on how to select a video wall system, let us first understand what exactly is a video wall system? As the name suggests, video walls are digital signage with multiple LCD or LED screens joined together to from one large screen. These individual screens interact with each other through a controller and software to give output as a whole. The controller allows users to connect content sources to display and provide output as a single display. The video wall system software work as an interface, it provides a dashboard so that user is able to view the list of available tasks and actions to be performed. A software interface allows users to select sources and place them in real-time displays. This includes features like select, scale, crop, brightness, contrasts, etc. In today’s market video wall functions are versatile and provide advance management systems; depending on the industry they are being used. Video walls systems are great for wide range of industries including retail, hospitality, advertising, auditoriums, control rooms, security, transportation and many more. Video walls can also be customized to according to size and configuration preferences. Environment – If video wall system will be used in applications requiring 24/7 operations, durable displays with longevity features are a good option. Many video displays offer redundant power supply with minimal chances of downtime and frequent part replacement. Budget– Another key factor which should never be overlooked is budget, a video wall system can vary drastically in price. Having a budget in mind allows you to explore options that falls within your budget and required functionalities. Brightness and resolution – Use and operating conditions of video wall system has to be considered for an effective image quality. It depends greatly on for what purpose the display is being used. For instance, displays addressing information should be able to deliver sharp images so that readers are able to have a clear view or if displays are placed in area with presence of lots of natural lighting.Brightness and contrast features play a great role in giving that perfect view of your needs. Managing content and shared displays– Video wall system should be able to control dynamic activities and interactivity on the screen. Many times the displayed content has to be send to multiple video wall systems. Controller should be able to manage multiple display surfaces and accommodate different settings for each display. Durability– Depending upon the nature of use, video wall controllers should offer maximum resolution and uninterrupted power supply. Ultra high resolution display (UHD): Many industries require superior graphic processing capabilities, video wall controller should features excellent graphics hardware and emphasize on superior graphics quality. User– While choosing software for your video wall it is recommended to keep in mind how much the user is familiar with the system. 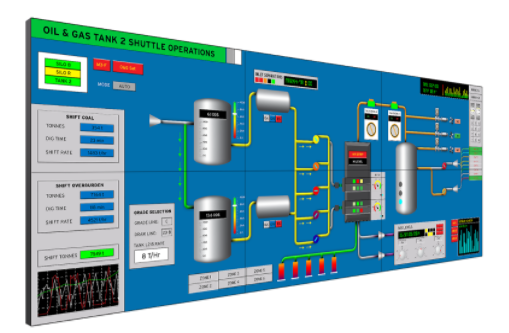 User-friendly interface is the key in case of first time operators. For experienced operators, software should have all advance features with easy to operate interface. Multi-user support– If the system will be accessed by multiple users, software solutions should allow multiple user sessions or accounts. Each user should be able to work according to their settings and even switch modes when required.